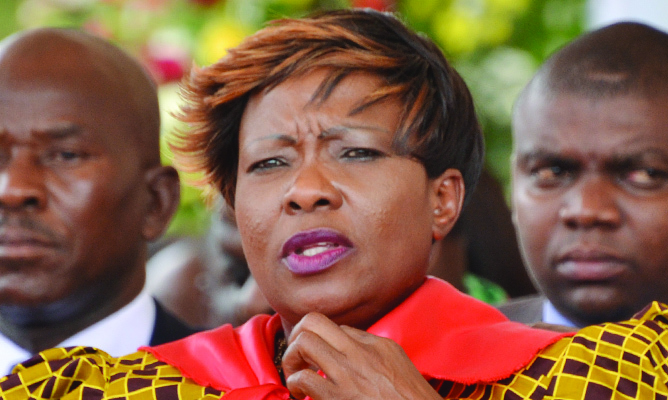 FIRST Lady Auxillia Mnangagwa yesterday met church leaders from across denominations and impressed upon them the need to embrace the national clean-up campaign launched by President Mnangagwa last month. The President designated the first Friday of every month as National Environment Cleaning Day. The First Lady, who is the health ambassador and has been on the forefront of fighting diseases like cholera and typhoid, said the church was an important sector in ensuring a culture of cleanliness. "As a country there is an area that we need to explore further and work together as a team in addressing it. We are gathered here today to deliberate on the monthly cleaning exercise that was launched as a national event by His Excellency President Mnangagwa. "The overall objective of this cleaning exercise is to ensure that everyone puts into practice what was agreed during the launch of the clean-up campaign," she said. She urged church leaders to encourage their congregants to practise good hygiene to prevent outbreaks of diseases like cholera. She said it was everyone's responsibility to participate in the National Environment Cleaning Day. "Zimbabwe has witnessed an outbreak of cholera and typhoid associated with unclean environments resulting in a number of fatalities. As long as the environment remains unclean and contaminated causing water-borne diseases, the battle against such outbreaks will continue to be hazardous to our lives. We cannot afford to keep losing lives on causes that as a nation, if we work together, we can eradicate. The Bible encourages us to live in clean environments," said the First Lady. She said it was important for the country to have a sustainable waste disposal system. "Churches and religious organisations are an important institution and community in our country. They are playing important roles in our society and some of your initiatives are complementing Government's efforts in development," said the First Lady. She thanked churches that participated in the inaugural clean-up campaign last week. "The participation of churches in the National Day of Cleaning is very important as you will also be adhering to God's call to stay in clean environments. Congregants should come out in large numbers and we will be very happy to be led by churches," she said. Last year in October, the First Lady visited homes in Budiriro and carried out household chores in a bid to instil a culture of cleanliness in society. She did the same Glen View 3. The two suburbs were considered to be the epicentre of a cholera outbreak which claimed about 50 lives. "In 2018, I initiated clean-up campaigns in Harare working with the Ministry of Environment, Ministry of Health and Child Care, Harare City Council and the corporate world in an endeavour to promote cleanliness at household level and surrounding environments. "In Mashonaland West Province, I initiated cleanliness at household level as well as their surrounding areas to which the women took it upon themselves to keep their homes clean. This programme will continue in all the provinces," she said. "I am encouraging wives of the church leaders to take this to the women in their churches and make sure that cleanliness is carried out at each household," she added. Church leaders pledged to mobilise their followers and lead in the national cleaning exercise. They set up a liaison committee to coordinate the efforts. "On behalf of Tehila Christian Network, we are ready to continue the exercise in our respective communities. We are going to send a message to our parliamentarians to join hands with us and educate people in their constituencies on cleanliness," said Reverend Sam Malunga of the Tehila Christian Network. Apostolic Christian Council of Zimbabwe (ACCZ) leader Bishop Johannes Ndanga concurred with the First Lady on the need for cleanliness. "As leaders of churches, we are going to mobilise our congregants so that we all join forces and participate in this cleaning exercise. This is a national event and it is everyone's responsibility to maintain cleanliness. We want to thank the First Lady for leading us," he said. Ms Shuvai Wutawunashe from the Family of God Church (FOG) weighed in saying: "On February 5, Amai wants you the church leaders to speak up and reach out to your followers and mobilise them and join the whole nation in this cleaning exercise. Your congregants listen to you as their leaders hence this meeting so that we organise ourselves and co-ordinate."